Today, one of the biggest drawback of smartphone is Battery Backup within few hours of usage the battery level of smartphone decreases. Usually, this problem is seen in the Indian manufacturer smartphone. Realizing the high utility of smartphones, long hour chatting and longer browsing iBall comes with Andi 4.3J smartphone. 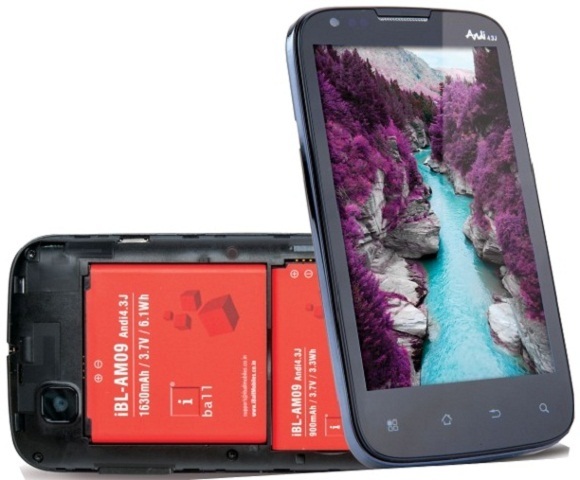 It is a first dual battery smartphone to be launched in the Indian Market. One of the significant feature of this smartphone is that it comes with dual battery; one gives 1,630 mAh and another gives 900-mAh battery, which together give output of 2,530 mAh battery. It is a boon for travelers and gamers. Another peculiar feature of iBall Andi 4.3J smartphone is that it comes with Dual-SIM capabilities. It has 4.3 inches capacitive touchscreen display. It will run on the Android 2.3 Gingerbread operating system that would be one of its drawback. Manufacturers does not concerned on to update Android 4.0 Ice Cream Sandwich Operating system. iBall Andi 4.3J will be powered with 1Ghz ARM Cortex A9 processor and includes the 512 MB of RAM to handle the multi tasking at enough pace. The device includes 5 mega pixel camera on the rear side by which you can take 720p HD videos and take photos as well. The device further includes 512 MB of RAM and microSD card slot that supports additional storage upto 32GB. The device supports 3G internet connectivity, Bluetooth, GPRS, Wi Fi, Wi Fi tether and EDGE for connectivity. Though it has larger battery back up, the iBall Andi 4.3j is slightly priced higher at Rs.9,499. Other devices from iBall includes Andi 5c, Dual-SIM Andi 3e and Andi 4d and Andi 2. In the same price range there are dozens of android devices are available. For example: Karbonn A18 featuring Android 4.0 ICS, dual camera- 5 Mega pixel rear and 1.3 mega pixel front, dual SIM, 1,500 mAh battery whereas the Micromax Superfone Canvas A100 features 5-inch display, Android v4.0, dual SIM and 2,000 mAh battery. It will be available at selected iBall distributors and leading retail stores like More Super Store, Spice Hotspot, Reliance Digital, Sangeeta Mobiles, The Mobile Store and local vendors.